Back in 2008, Brooklyn Borough President Marty Markowitz began a project to turn Coney Island’s vacant Childs Restaurant Building into an amphitheater. In 2013, despite opponents to his plan, a major public oversight board voted unanimously to move forward with it. The following year, he paused the Seaside Summer Concert Series to “put [their] energy and resources into planning” for the new venue. Coney Island continues its transition with exciting new attractions rising along the Boardwalk. The Aquarium’s $157 million expansion, “Ocean Wonders,” will finally connect the Aquarium to the ocean with an overlook and restaurant cantilevered above the Boardwalk. A mile to the east, the long-awaited restoration of the Childs Restaurant Building has begun. The landmark structure has been gutted to the bones, soon to be combined into an adjacent 5,000-seat amphitheater, slated to open by summer, 2016. 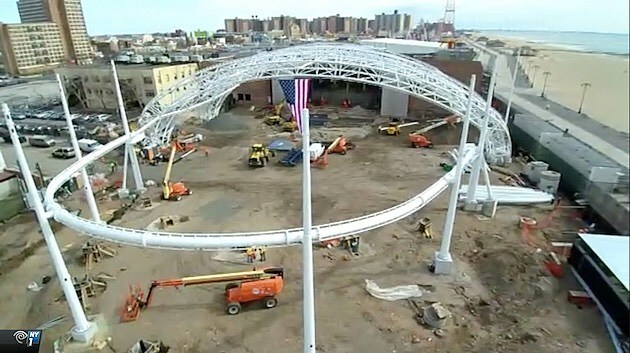 The The Amphitheater at Coney Island will also house a restaurant, and the seats are covered. As many as 40 shows will be part of the initial slate, booked by Live Nation, and 15 of those will be free shows as part of the Seaside Summer Concert series. Two scheduled shows surfaced so far: 311 and Matisyahu on July 16 and the “Carnival of Madness” on August 7 with Shinedown, Black Stone Cherry, and Whiskey Myers. The full initial schedule will be announced later in March. Stay tuned.